Do vaccines contain toxic chemicals? The smallpox vaccine saved hundreds of millions of lives. Arguably it qualifies as one of the most important inventions in history. But that doesn’t mean it was a welcome invention when it first came around. 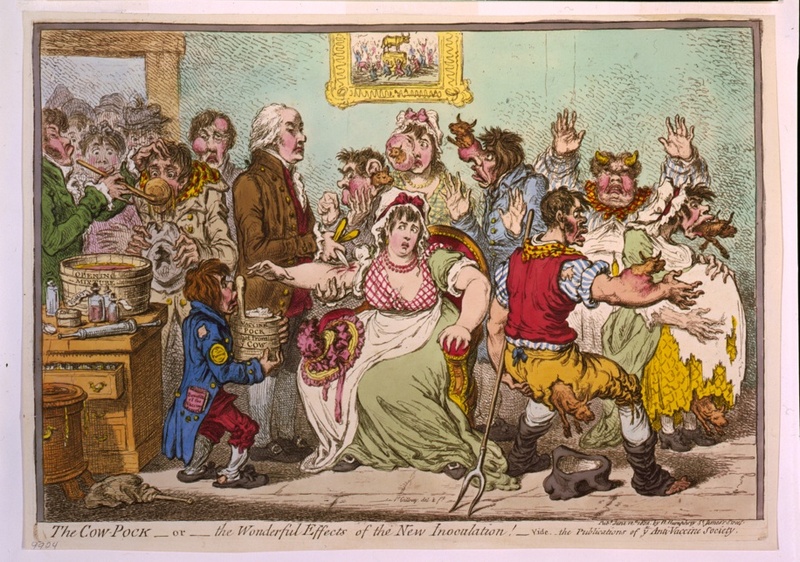 Check out this cartoon apparently done shortly after Edward Jenner introduced his smallpox vaccine. The artist seems to imply that infecting people with cowpox will make them turn into cows. As this cartoon illustrates, there was actually some hostility towards the vaccine back when it was first introduced — ironic, given the smallpox vaccine may have saved more lives than any other medical intervention in history. So as it turns out opposition to vaccines is as old as vaccines themselves — and as a quick search on Google will demonstrate, it’s alive and doing better than ever today. Admittedly, modern anti-vaccine activists no longer seem worried about their children turning into farm animals. Nowadays they make other arguments instead. The most determined and capable anti-vaccine group in existence that I know of is the National Vaccine Information Center(NVIC). When I type “vaccine” into Google, the NVIC actually shows up on the first page of results. You can get a feel for the kind of information the NVIC offers from a brief trawl through their website, which turns up pages like this one by a Dr. Julian Whitaker, apparently a practitioner of alternative medicine. Any doctor who assures patients that vaccines are completely safe is flat-out lying…Depending upon which vaccine is being administered, a single shot can contain a brew of adulterated bacteria, viruses, aluminum, mercury, formaldehyde, hydrochloric acid, and/or numerous multisyllabic chemical additives. To say that repeated exposures to such a wide range of toxins have no cumulative adverse effects on a child’s developing nervous and immune systems is more than irrational—it’s diabolical. This paragraph — like the remainder of the NVIC website — is a noxious brew of fallacies and misinformation. Unfortunately, it’s misinformation of a particularly insidious kind, which is why these same arguments are repeated so often across the Web. The CDC has a list of the ingredients and reagents pharma companies use to manufacture vaccines at this link, and compounds like formaldehyde, thimerosal and various aluminum salts do indeed appear on it. But their presence is by no means as ominous as the NVIC would like you to think. To understand why, we have to think for a minute about how and why we make a vaccine. I said in a previous post that Nature makes poisons more terrible than any chemist can invent. One of the best examples of Nature’s murderous skill is the bacteria that cause diphtheria, a deadly disease that used to be especially common in children. The Spanish called it “El Garrotillo”, The Strangler, and as recently as the 1920s, it caused 13-15,000 deaths in the US each year. The weapon these bacteria use to kill their victims is a large protein molecule called the diphtheria toxin (structure below). The diphtheria toxin gets into your cells by sticking to a molecule on the cell surface, tricking the cell into treating it as legitimate cargo. 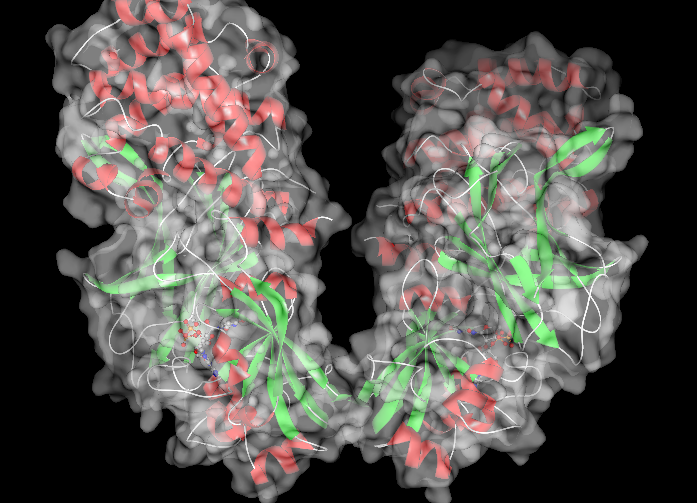 Once inside, it gets broken up into pieces; one of these fragments catalyzes a reaction that shuts down protein synthesis, bringing the cell’s normal operations to a grinding halt. We can fight diphtheria by taking advantage of your immune system’s built-in memory capability. The immune system has a remarkable ability to remember invaders it’s encountered previously. When it meets the same enemy a second time, it mounts a devastating response that prevents the invader from gaining a foothold again. If we can introduce your immune system to the diphtheria toxin, it can destroy the invaders before they make it past the shoreline. It sounds nice in theory; but how can you arrange for your immune system and diphtheria toxin to meet? If I just inject you with straight diphtheria toxin, it would kill you rapidly. What we need is a way to inactivate the protein — to damage it so it becomes harmless. That’s why we treat diphtheria toxin with formaldehyde. Formaldehyde is a much simpler and smaller molecule than diphtheria toxin — just one carbon atom, two hydrogens and an oxygen. Oxygen is more electronegative than carbon, meaning it tends to hog the electrons they share (think of it as an unusually selfish spouse). The oxygen is double-bonded to the carbon, so the carbon ends up very electron-poor, and the two wimpy hydrogens aren’t much help. So formaldehyde tends to act as an electrophile, an electron-poor molecule looking for love in all the wrong places. When you treat diphtheria toxin with formaldehyde, it reacts with relatively electron-rich nitrogen atoms in the protein, crippling it in a way that makes it harmless. Formaldehyde-treated diphtheria toxin is inactivated — it can no longer get inside your cells and shut them down. Your immune system, however, can recognize the inactivated protein and remember it for future reference. Treating diphtheria toxin with formaldehyde is a clever solution to the problem, and in fact vaccine manufacturers inactivate tetanus toxin in the same way. We have to be a little careful, however, because the same reactive nature that makes formaldehyde useful also makes it potentially dangerous. It can react with proteins and DNA in your cells in just the same way it reacted with the diphtheria toxin. So formaldehyde is diluted during the manufacturing process, and the remaining quantity in the finished vaccine is less than 100 micrograms (100 millionths of a gram) per dose. Formaldehyde in a vaccine might sound unnerving. Isn’t formaldehyde a toxic chemical? But toxicity is a more slippery concept than popular culture would have you believe. (See my earlier post, “What Does ‘Toxic’ Really Mean?”) When we talk about toxicity, there’s a number of things we have to think about — how does your body metabolize the compound, how quickly is it excreted, and how much is too much? There’s an old saying that “the dose makes the poison”, and it’s certainly true in this case, because small quantities of formaldehyde are being generated by ongoing processes in your body right now. Your blood and tissues have a natural concentration of about 2.5 micrograms (millionths of a gram) of formaldehyde per milliliter. If you do the numbers, it turns out that a newborn baby’s bloodstream has over 10 times more formaldehyde than a vaccine at any given time. Moreover, your body metabolizes formaldehyde very quickly, converting it to formic acid and either excreting the formic acid in your urine or converting it to carbon dioxide. The tiny quantity of formaldehyde in a vaccine doesn’t hang around for very long. At higher doses, formaldehyde can indeed be quite dangerous, but the amount you have in vaccines like DTaP simply isn’t large enough to be a problem. It’s a tiny fraction of the amount your body already generates and breaks down as a matter of course. Foods like meat and fruits naturally contain small quantities of formaldehyde and/or compounds your body converts to formaldehyde anyway, so your diet exposes you to far more significant quantities of formaldehyde than you get from a vaccine. Dr. Whitaker also mentions hydrochloric acid as a “toxin” of concern. It’s an unfortunate argument, because it strongly suggests he’s being disingenuous. Either that, or he somehow skated through college and medical school while flunking general chemistry. Let me explain what he forgot to tell his readers — and I’ll keep it as simple as possible, so even Dr. Whitaker can follow along. 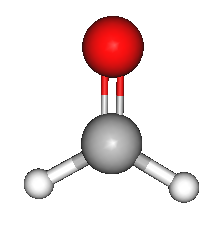 Hydrogen chloride is a simple molecule — a hydrogen atom stuck to a chlorine. When you put it in water it separates into a hydrogen ion* and a chloride ion. pH is a measure of hydrogen ion concentration; lower numbers mean more hydrogen ions and hence a more acidic solution. If I mix hydrochloric acid with a base, the base and the acid react and I end up with water and a salt. Mixing equal amounts of sodium hydroxide and hydrochloric acid, for example, gives me water and sodium chloride. Imagine for a minute we have a public swimming pool with a pH that’s too high(i.e. too basic). Swimming pool pH needs to stay between 7.2 and 7.6, so you might add a little hydrochloric acid (aka muriatic acid) to bring the pH back down into the right range. Once you put it in the pool, the hydrochloric acid reacts with some of the excess base to make water and salt and you reduce the pH. The same is true when we use hydrochloric acid to adjust the pH of a solution in the lab, as for example when we manufacture a vaccine. The only thing that makes hydrochloric acid dangerous is the low pH of a hydrochloric acid solution. If you’ve mixed the hydrochloric acid with base and brought it back to a neutral pH, however, it is in no way dangerous — no more so than a glass of water with some table salt in it. The aluminum salts play a much more interesting role. Manufacturers add salts like aluminum hydroxide to certain vaccines because they make vaccines more effective — you get a much more significant response to the vaccine. We’re not completely sure why that happens, although we have some theories about it. We do know, however, that you and I are exposed to plenty of aluminum as part of everyday life. Aluminum is the third most abundant element in the Earth’s crust; it’s abundant in many types of soils, especially soils rich in clay. You consume small quantities of aluminum in the food you eat, and human breast milk contains aluminum on the order of ~40 micrograms per liter. Although aluminum can be dangerous in very high doses, any compound can be dangerous if you take too much, and there’s no reason to believe aluminum is dangerous at the level present in a vaccine, which are measured in fractions of a milligram. Which brings us at last to the most controversial additive on Dr. Whitaker’s list: thimerosal. Its use in vaccines dates to the 1930s, and it was prompted by a series of nasty accidents with multi-dose vaccine vials. By sticking the needle through the rubber septum on the vial multiple times, nurses and/or doctors sometimes introduced bacteria by accident, and some children were inoculated with vaccines from Staph-contaminated vials. To avoid these lethal accidents, vaccine manufacturers began incorporating thimerosal as a preservative in multi-dose vials back in the 1930s, and starting in 1968 preservatives were required in multi-dose vials by law. It’s worth pointing out the guidelines for the amounts of thimerosal in vaccines were based on methylmercury, even though thimerosal breaks down to ethylmercury in the body, and ethylmercury is excreted much more rapidly than its infamous cousin. (Nearly all fish and seafood contains traces of methylmercury BTW. Seawater itself contains mercury, albeit at extremely low concentrations.) Nor is there any evidence to suggest thimerosal was dangerous at the levels found in vaccines. Right now, however, the safety of thimerosal is a moot point, because it’s been removed from pediatric vaccines as a precautionary measure. Currently there are no pediatric vaccines on the routine schedule that are manufactured with thimerosal as a preservative. Indeed, this has actually been true for some years now. The MMR vaccine does not and never did contain thimerosal. Some vaccines like influenza vaccine contain thimerosal, but there is a limited supply of thimerosal-free influenza vaccine available for patients who so prefer. Given what we know about how vaccines are made, why do opponents continue to talk about “toxic chemicals” in vaccines? This is a tough question to answer. We can understand why vaccines might have aroused controversy in the early 19th century. After all, Jenner himself didn’t know for certain why vaccination worked; he just knew from experiment that it did. Today, however, we know a lot more about immunology. So why do vaccines elicit so much hostility? This part is just my opinion, but I think there’s a couple different things going on. *The hydrogen ion actually gets picked up by a water molecule to make H3O+, the hydronium ion, but it’s the same general idea. Dr. Whitaker, Dr. Mercola and other supplement-sellers stand to make money off the anxieties of patients and parents — and that’s why they spread this kind of misinformation. It’s unfortunate, but these people are unregulated, and it’s what they do. The second factor is the media. We’ve all heard about the whole Wakefield-autism-vaccine controversy, which began with a single deeply flawed study published in the Lancet back in 1998. Now ask yourself this. Would you or I ever have heard of this study if it hadn’t been for some tragically gullible health reporters? Of course not. Many thousands of scientific studies are published each year, and most of us don’t read The Lancet. The media took Wakefield and made him into a public figure by mistake. Over the past few years the media has definitely come around, of course. Most articles you see on vaccines nowadays emphasize their safety. Unfortunately the damage has already been done. The final reason is the most interesting one. I think vaccines are actually victims of their own success. They’ve done an incredible job of eradicating diseases that once killed or crippled thousands or millions of people. Neither you nor I know anyone whose child perished at the hands of El Garrotillo. Neither you nor I can remember friends or family who were crippled by polio or died of smallpox. Around the world, tens of thousands of babies die of neonatal tetanus or lockjaw every year, but it doesn’t happen in the US, so we don’t think about it. We take what we have for granted; we assume it was always this way. Many people apparently see vaccines as “unnatural”, and we forget there’s nothing so natural as infectious disease. When we battle bacteria like C. diphtheriae, our enemy is Nature itself. Vaccines are the most effective weapon we’ve found in what would otherwise be an unwinnable war. It would be a shame to let complacency betray us into defeat. There’s a really nice summary of the evidence on vaccines and autism at this link, by Jeffrey Gerber and Paul Offit. It’s free access, so if you’re interested check it out. Paul Offit and Rita Jew. “Addressing Parents’ Concerns: Do Vaccines Contain Harmful Preservatives, Adjuvants, Additives or Residuals?” Pediatrics December 1 2003: 112(6), 1394-1397. Karen Broder, Margaret Cortese et al. “Preventing Tetanus, Diphtheria, and Pertussis Among Adolescents: Use of Tetanus Toxoid, Reduced Diphtheria Toxoid and Acellular Pertussis Vaccines.” Centers for Disease Control: March 24, 2006. Agency for Toxic Substances and Disease Registry: Aluminum, Relevance to Public Health. Sundeep Dhareshwar, Valentino Stella. “Your Prodrug Releases Formaldehyde: Should You Be Concerned? No!” Journal of Pharmaceutical Sciences October 2008: 97(10), 4184-4193. This entry was posted in Germs and tagged disease, Germs, health, myths, quacks, science, toxic chemicals, toxins, vaccines by puffthemutantdragon. Bookmark the permalink. I can appreciate arguments for example, that “there isn’t enough X in vaccine brand A to be harmful” – but that simple statement assumes a standard quantity, standard recipients, and a standard background environment. If quality control is not that great – should I assume it is, I doubt it – then what if there is significantly more of X in some percentage of vaccine units. Then, combine with varying human sensitivity (which even more clearly should not be taken as if “average”), and maybe the worst 10% of vaccines combined with the most vulnerable 10% of recipients, means in 1% of cases there will be an adverse reaction that doesn’t make sense in terms of simple-minded averages (“assume a spherical cow …”) Also, additional environmental variables could intrude (extra mercury already consumed, and a bit more pushes some vulnerable person over the edge, etc.) Anyone been working on this angle? We can’t view this in simplistic terms. We’re not talking about regulation in terms of averages, we’re talking about concentrations not to exceed specified value. Manufacturers have to submit samples from each lot to FDA, together with their own in-house test results, and the whole process is tightly regulated. There HAVE been several recalls for specific batches, but these have been very unusual. Certainly much more unusual than recalls of, say, faulty cars (like the Fords recalled just recently because their wheels could fall off). The process you have in place for vaccines is much more tightly controlled than that for most other consumer products. You also mention adverse reactions. There are cases of severe adverse events like allergic reactions, but these are extremely rare — under one in a million doses. Food allergies, by contrast, cause 150 deaths a year in the US (see http://www.fda.gov/downloads/Food/ResourcesForYou/Consumers/UCM079428.pdf), half of which are due to peanuts & peanut products (e.g. peanut butter). But we do not think of peanut butter as dangerous, because the media does not portray it the same way. Substitute Merck and GSK for Drs Whitaker & Mercola and you have a more accurate picture of who is profiting from the illness of human race. When Merck submitted the same research to the New England Journal of Medicine they tampered with the safety data so it matched the conclusions. The NEJM Chief Editor Jeffrey Drazen claimed Merck “hoodwinked” the journal and demanded corrected data which Merck never supplied. The journal has never retracted the study in spite of Vioxx causing over 60,000 deaths in the USA alone & hundreds of thousands of injuries worldwide. The Cleveland Clinic’s Eric Topol and Steven Nissen exposed the fraud in 2000 using the very data Merck submitted to the FDA, but the FDA ignored them. Several other researchers also showed the harm Vioxx was causing. Merck scientist Alise Reicin ‘s job was to personally visit & threaten the honest researchers with professional harm is they published. Reicin is now a Merck executive. Eric Topol had his position at the Cleveland Clinic eliminated. Vioxx would be on the market today if not for David Graham and Senator Grassley. While in the middle of the Vioxx debacle Merck had partnered with Bristol Meyer Squib on Squib’s diabetes drug Pargluva. Merck used the same shenanigans with data they used for Vioxx. It had cleared all regulatory hurdles when in step Topol and Nissen showing the data submitted to the FDA did not match Merck’s safety conclusions about Pargluva. Pargluva, like Vioxx, was causing heart attacks & deaths. The FDA could not ignore Topol & Nissen again, as they had done with Vioxx, because they were in the middle of Vioxx being exposed as a killer with FDA asleep regarding peer review or complicit by deliberately ignoring peer review. So the FDA asked for more safety data from Merck and Bristol. They didn’t supply it. Merck & Bristol simply walked away from the approval process without withdrawing the drug from consideration. They dissolved their partnership and the FDA took no action against either drug company for the deliberate lying conclusions supplied with the research data. Why would Merck give the correct data to the FDA but a safety conclusion that didn’t match the data, yet giving the same research to the New England Journal of Medicine they falsified the data? It’s very simple. It is against the law to tamper with the data submitted to the FDA, but a conclusion is an opinion on what the data means. The NEJM editors would have actually checked the data against the conclusions of safety, so Merck had to falsify the data to match the safety conclusions. It’s not against the law to lie to a journal editor or in a published study. But this raises another question… why was Merck apparently certain that the FDA would not compare the data and safety conclusions? Why did the FDA ignore Topol and Nissen in 2000 when they first alerted the FDA on Vioxx deaths? Merck evecutives and scientists do not care about their patients, only about taking market share by any means necessary. These same murderers sell 13 vaccines. They and their products can’t be trusted and neither can FDA bureaucrats. In 2004 when David Graham blew the whistle on Vioxx his superiors at the FDA went after him. Senator Grassley stepped in to protect Graham and later that year Merck suddenly withdrew Vioxx “voluntarily”. While all this was going on Merck was developing Gardasil and Julie Gerberding was rabidly promoting vaccinations while the CDC budget tripled under the Bush administration. Gerberding began paying drug companies to gear up for 300 million doses of flu vaccine, anticipating it to become mandatory. Gerberding also authored an article hawking am unnamed multivalent HPV vaccine against cervical cancer and genital warts two years BEFORE Gardasil was approved by the FDA. Gerberding is now Merck’s Vaccine Division President at a guestimated 5-6 times her CDC salary. The system of drug regulation and safety is hopelessly compromised by the adtions of drug companies bribing regulators and enforcers. This has been going on since the days of Aspartame and Searle Pharmaceutical’s public relations firm Buston-Marstellar hiring away federal prosecutors (Skinner, Conlon) who delayed prosecuting Searle long enough for the statute of limitations to expire on the charges of submitting false data in support of Aspartame safety. Burston then hired FDA commissioner Arthur Hayes at a salary of $1000 per day for 10 years after Hayes approved aspartame first in dry goods then in beverages despite the FDA created Public Board of Inquiry that recommended for the 10th time NOT TO APPROVE ASPARTAME because of concerns about brain tumors & other adverse effects. The system needs a complete overhaul and criminal statutes need to be in place regarding data conclusions of submitted studies and against all parties where bribery occurs. Criminal statutes exposed Searle in the 1980s and caused Merck’s downfall with Vioxx and Pargluva in 2004 & 2005. Deaths that occur as a result of fraud, when executives and scientists know a drug or vaccine is killing kids or adults, need to be prosecuted as the homicides they are. With Vioxx Merck executives and scientists got away with murdering 60,000 Americans. More American lives than were lost in the Vietnam War… yet in spite of the last deaths occurring in 2004, no one at Merck has been prosecuted and payments from a fund that Merck executives set up and control, paid the first compensation in 2012 with the vast majority of victims still awaiting compensation or rotting in their graves… while Merck has been making billions in investments with the profits they made from over $11 billion in sales worldwide. Compensation schemes set up in Canada Britain and Australia are NOTHING compared to the US compensation fund (totaling less than 100 million compared to $4.5 billion in the USA). All funds are controlled by Merck and earn money for the company while awaiting claims to be adjudicated. Over the past 5 years the stock market has doubled in value, on average, and we can expect that Merck has made a tidy profit that will more than make up for any revenue lost to paying claims for the dead and dying due to their deliberate and knowing fraud. Mutantdragon needs to get his facts straight and help to protect the lives of children with proper screening of suspected susceptible kids BEFORE vaccination. Just screening kids with all the parameters set up in the MMR package insert would not only dramatically reduce the injuries that are occurring, it will drastically reduce new autism diagnoses as we stop injuring kids brains through direct infection with live pathogens to indirect brain damage by injuring their immune systems. I’ll give you allergic reactions, but as mutantdragon said, very very few of these reactions end in anaphylaxis, the majority of reactions we do see result in symptoms like edema, lethargy, soreness at the injection site, etc. And just as MD also mentioned, countless more die from fatal infections that could have been prevented by vaccines. If you’d like more perspective on vaccine reactions, I recently reviewed a couple articles detailing their prevalence in the veterinary world here: http://blogs.oregonstate.edu/abouck/2011/11/26/article-review-vaccine-reactions/ . I believe that this is an excellent article, because it does such a good job at explaining vaccine science and risk. I found this because it was posted by Bora Zivkovic on Google +. I agree with you that “All too often, reporters explain science & health issues by not explaining them.” Better communication is crucial. I’d like to see your clear explanations of diphtheria, for example available to new parents in such places as pediatricians offices. Pediatricians frequently start out needing to be the explainers of crucial information to parents whom they have just met, and on an insurance dictated time schedule. Pediatricians offices need to be better set up to handle patient education. One of the things that is apparent in vaccination campaigns as in other social issues, is that it takes place in a society where racial, cultural and economic biases are also prevalent. In California, whooping cough has been diminished, not so much by pounding on anti-vaxx parents in white upper middle class areas, but by focusing on more significant aspects of public health. In the Central Valley, a program of attempting to establish a “cocoon of safety” around newborn infants is meeting with success. This recognizes that it is non-immunized or no longer immune parents, other relatives and adult caregivers who are most likely to transmit whooping cough to too young to be immunized infants, not some anti-vaxx parent’s kid down the street. How many of us adults have had our boosters? Other programs are aimed at specific communities with specific problems, such as programs for mothers most likely to transmit Hepetitis B to their infants. Sometimes it is the community which pressures the public health officials into providing vaccinations. This has been true in Fort Collins, CO, regarding meningitis (invasive meningococcal disease): http://www.9news.com/news/story.aspx?storyid=141670&catid=339 In this case, even with three deaths, it was initially the local public health department that was telling people that vaccination was too expensive, don’t bother. The Fort Collins area now has ongoing fundraisers to provide vaccinations. So I believe that there is quite a bit of strong support for vaccinations. I think that we are much more likely to succeed if we focus on public education and health policies overall and diminish the direct jousting with anti-vaxxers. I think that this jousting, in many ways, backs us into corners that actually serve to make the anti-vaxxers seem more reasonable to the general public than they would otherwise. You raise a good point I hadn’t really thought about. Tanks don’t waste ammo shooting at mosquitoes, so if a tank is firing, we tend to assume there must be something worth shooting at (bad analogy, but the first that came to mind). Maybe the public actually takes NVIC et al. more seriously because science writers/bloggers/journalists spend so much time on them. Maybe the anti-vaccine movement is slowly withering away of its own accord. Certainly it seems less influential now. I think what really bothers me is the way journalists handled the issue. First of all they spend years making Wakefield a household name, then they turn around and tell everyone don’t worry, forget what we just said. But even after they changed course, they never bothered to explain the science at a sufficient level of detail; they just told parents, “Experts agree vaccines are safe!” This is true and it would reassure parents under ordinary circumstances, but it won’t reassure parents when you’ve just spent the past several years frightening them with the Wakefield boogeyman. Media has a very short attention span, and they assume readers do too. Which reminds me: should do a post about science & the media one of these Saturdays. Hate to rant about that, though, because plenty of other people do too. I believe that even without Wakefield, more communication would be necessary. Pediatricians themselves need to come up with better mechanisms for dealing with patients in the short time periods insurance companies allow them. And patients need the flexibility to select a doctor they can trust. One of my pediatricians came in while I was still in the hospital, announced he’d seen the baby, the baby seemed fine, it had 10 fingers and 10 toes, and then he walked out. At an early vaccination visit, he handed me free samples of Tylenol. When I asked him what for, he explained it was really for the parents. If the babies would just stay quiet, the parents wouldn’t get upset for no good reason and call him. Fortunately, I was able to move to a different pediatrician at that point. But later, he was quoted in the newspaper regarding a sad case of an non-vaccinated child who died of measles. Personally, I tend towards the opinion that his own poor communication skills may have had a serious impact. One of the things medical professionals need to do is to allow more space between total acceptance of the medical professionals word for it and complete denialism. And if they don’t have time or the inclination themselves to communicate, they need to set their offices up with assistants who can perform much of that function. Some schools ban peanut butter from all lunches and snacks now due to allergy risks to a few children. Too many vaccinations, given over too short a time span in an infant’s life is a concern of mine. The number of foreign chemicals may overwhelm the immune defenses and detoxification systems of an infant or toddler, especially if some other genetic or malnourishment problem existed. Lack of education about giving shots only when the child is healthy and pushing kids through a busy schedule instead of rescheduling shots for any mildly sick children may increase risks to individuals. Having vaccinations for every single minor childhood illness may not be letting the cellular half of the immune system develop during minor sicknesses. Vaccinations challenge the antibody part of the immune system, but actually fighting off a childhood cold or case of chickenpox would also build the body’s white blood cell and lymphatic strength. Getting the mercury preservative out of childhood vaccines was a big plus because the small amounts added up when counting all the shots given over the early childhood years. I’m confident that an adequate preservative was substituted before removing the mercury containing preservative. Sorry, but I think you need to actually learn something about vaccines before squealing “too many, too soon”. 1)Killed or Subunit vaccines stimulate a primarily Th2 response (Anti-body based immunity), which is would occur from a bacteria infection anyway. Viruses are less effected by Th2, as it cannot attack infected host cells, but many viral vaccines are live-attenuated strains, and as such invade the hosts cells, without causing dangerous proliferation, but while expressing their proteins on MHCs. As such, they stimulate a far more Th1 response (Cytotoxic T based). There is no common cold vaccine, so you’ll still get that anyway. 2) As the article mentioned, Hg-Et has a very short blood half life (roughly 3.5 days). ie, after roughly 12 days, you’ll have <10% left in the blood. After the month between each round of vaccines (using the NHS list) you'd have 0.196% of any Hg-Et left in the blood, much less than would occur in the diet. Obviously, rather mute, since thermistol was removed, but it was never a danger. am learning a lot from your site, thanks!